These items are available for purchase through the Grand Marais Historical Society, and all proceeds will go to the Historical Society projects.. Some items are limited-edition, and orders will be filled on a first-come, first-served basis. Ordering is easy. Simply use this e-mail link to send us your name, address, and a list of the items you want. We'll reply within 24 hours with item availability and shipping totals. We'd prefer you send us a check or money order, as this saves us having to charge PayPal fees. When we confirm your item availibilty, your items will be set aside and earmarked for you until your payment arrives. If you prefer to use PayPal, let us know in your e-mail and we'll send you an invoice through PayPal.. We now accept credit card payments via PayPal. We'll ship the items Priority or Parcel Post - your choice. We're proud to present our photo history from Arcadia Publishing! 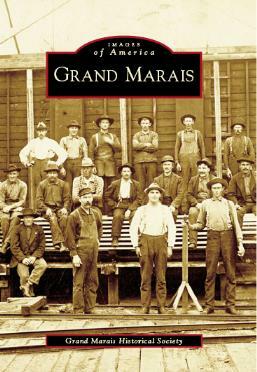 Grand Marais is a journey through time from the very beginnings of a settlement in Grand Marais to the present day. Filled with over 220 historic images, all with captions, this is a must-have for anyone who knows and loves our town. Featured sections include Early Settlement, the lumbering area, Grand Marais in the boomtown days, from Boom to Bust, the fishing industry, the Lifesaving Station, the growth of Tourism, and more. Gemstone and Bead Bookmarks, Only $5.00! Every good book needs a special bookmark, and we have a number of beautiful ones available for purchase. These are handmade in Grand Marais by us. All are priced at $5.00 each. Agate Beads: This style features two large Botswana agate beads with two smaller agates and some accent beads. Each one is unique! These are strung on a polished cotton cord that won't damage your books. Krobo Beads: These bookmarks feature handmade glass Krobo beads from the Somanya-Krobo region of Ghana, West Africa. The beads are made of recycled glass, and the designs are handpainted on each bead before their second firing. We're pleased to use these beads in our bookmark designs, as this supports the Soul of Somanya Project. There are hundreds of designs, but tell us a main color and we'll send you a match! We can offer blue, green, red, brown, yellow, orange, or black. These are also strung on polished cotton cord. Mountain "Jade": These beads are a dyed Dolomite marble. We have them in red, blue, dark green, and purple, with goldstone star accents (black diamonds for the red jade beads). Tell us what color you'd like and we'll send it to you! These bookmarks are strung on coated jeweler's wire. Animal Beads: we have a limited supply of Animal Bead bookmarks. Right now we have red elephants, pink owls, black rabbits, green owls, orange fish, pink horses, orange and black roosters, green turtles, white or brown bears, and a few oddball animals we're calling Surprise Animal. These are strung on coated jeweler's wire. Gemstone Beads: We've made some beautiful bookmarks using various kinds of natural gemstones, such as red jasper, pink marble, rose and green unakite, purple amethyst, earthtoned leopardskin jasper, and more. Most of these bookmarks feature round beads like the ones shown on the Agate Bead bookmark, but a few are oblong. If you like lovely surprises, send us a color choice and we'll match a gemstone to it!